Will Voting to Retain a Judge Affect My Civil Rights as a Person with a Disability? 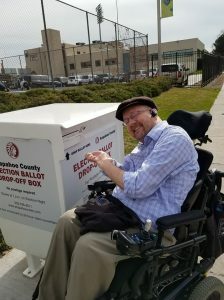 Pictured here is CCDC Civil Rights Legal Program Director, Kevin Williams, dropping his ballot into his local ballot drop box. 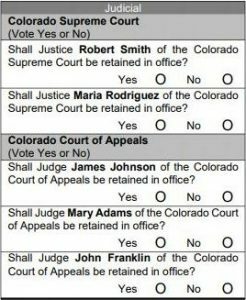 Pictured here is an example of one page of a ballot that shows the section about retaining judges, obtained from ColoradoPolitics.com. If you haven’t voted yet, and you know who you are, you better do so and do it FAST! During each election, I get asked “Kevin, which of these judges should I vote to retain?” The truth is these questions don’t really affect what CCDC Civil Rights lawyers do. Here’s why: the judges on your ballot are not Federal judges. We practice in Federal Court. State and other judges are appointed by the governor for certain periods of time. What you see on your ballot is the question of whether that judge should be retained. The ADA, Fair Housing Act, Section 504 of the Rehabilitation Act and most other disability rights acts that we enforce are federal laws. All Federal judges (District Court, Court of Appeals, and Supreme Court) are nominated by the President of the United States and confirmed by the Senate. I have explained this process in several blogs before. For example, see Judges! Hoo! What are They Good For? Absolutely Something. I have also explained why it is so important when you are voting for the President and for your senators to consider your civil rights. There are no U.S. senators to vote for on this ballot; you probably do have U.S. Representatives on your ballot. You definitely want to support those candidates who support disability rights. I simply want to make the point that U.S. Representatives are not involved in the confirmation process of federal judges, only U.S. Senators. Some ways to find information regarding State Court judges are: (1) review the Blue Book that should have been mailed to you or log on to the Colorado Office of Judicial Performance Evaluation – this is a good starting point; (2) get on the internet – there is a lot of useful information put out by organizations that may have a viewpoint regarding whether or not State Court judges should be retained; (3) if you are aware of lawyers who do practice in State Courts, contact them and get their advice. There are many ways to research how a judge has ruled on cases. This information is easily accessible on the internet and other sources. It is possible to bring a disability civil rights case in State Court under the Colorado Anti-Discrimination Act. If so, it might be important to find out how the judges on your ballot have ruled on such cases in the past. Try searching on the name of the judge and “disability” and “civil rights.” However, there are very few published disability rights cases that have been decided by State Court judges. I should also make clear that you can file a disability rights lawsuit in federal court under the ADA or other federal laws that protect the rights of people with disabilities, but the defendant can remove the case to federal court. They usually do that. It is a tactical advantage because it slows the case down. That is why it doesn’t really make sense to file a federal court lawsuit in state court. Remember, you can always just leave the box blank if you do not have an opinion on the judge to be retained. Your ballot will still count. And there are many important issues and candidates on your ballot you should vote for. See the CCDC 2018 Ballot Guide.